The Gents have released new songs for the first time in 30 years. An iconic and much loved Doncaster band have released their first new songs in 30 years. The Gents, who gained a cult following in the town and beyond during the 80s, have released a new EP and will play a sell-out concert next month. The band back in their 80s heyday. The mod revival band's Unfinished Business EP features newly written and recorded songs Wake Up and Pack Of Lies while the B-side features reworkings of classic Gents tracks Waiting and Day To Day. The band are also releasing a deluxe box set of all their single releases on one album called The Rise and Fall of The Gents. 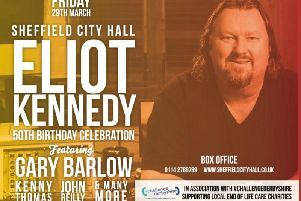 The band's revival will culminate in a show at Barnsley's Birdwell Venue on April 13 with all 500 tickets for the concert selling out two months in advance. Vocalist and bass guitarist Martin John Burton, lead guitarist Steve Chambers and drummer Glyn Davies, along with keyboard player Steve Kendal initially came together in 1980 as a cover band, playing songs originally recorded by The Who, The Kinks, The Jam, The Lambrettas and Madness, along with original material and other contemporary covers. The group become known for their mod influenced shows. A spokesman for the band said: "The Gents are back - and how! "Doncaster's absolute and undisputed finest are once again playing and recording for your pleasure. With this new EP they look set to ride a new wave of popularity." They attracted national attention after winning a competition hosted by EMI, the prize of which was studio time at Abbey Road Studios. The result was their debut single, the double-a-sided "The Faker"/"Le Pink Pantser" in 1981 and although not a commercial success, limited edition copies have sold for up to £70. The band developed a live following in the UK, playing up to five times a week in working men's clubs in the North and North-East of England. They were particularly appreciated at mod events, including the 100 Club on Oxford Street and also on the 1980s scooter scene and released a number of singles which appeared on independent charts in the New Musical Express and Melody Maker. A cover of The Easybeats' Friday On My Mind reached the top 100 and from 1980 to 1989, the band released nine 7" singles, two vinyl albums and one cassette only sampler album. The new 'greatest hits' album includes all of The Gents' single releases from The Faker in 1981 to Friday On My Mind in 1987 and includes fan favourites such as The Gent, Revenge and Stay With Me. Further details about the band and how to get hold of copies of the records are available at the band's Facebook page HERE.